Korean women’s skin care products, such as serums and sheet masks, made of natural ingredients are gaining popularity in Poland. Recently, leading media like women’s blogs Ofeminin, Chillizet, and Halo Ursynow; economic daily Gazeta Finansowa; and portal Interia reported in detail on the secrets of skincare by Korean women and popular Korean cosmetics. Every woman dreams of healthy and smooth skin. According to women’s blog Ofeminin, the AHA 7 Whitehead Power Liquid serum from the Korean cosmetic brand CosRX is popular because it is effective on the blackheads and blemishes that are common for Polish women. Looking at the reviews that users wrote, this serum leaves the skin clean and relaxed, making old marks disappear and helping prevent breakouts. Thanks photos and reviews by users who have seen changes on their own skin, the product is gaining popularity by word of mouth. The prices of Korean products are not cheap at all, but the reviewers emphasized the effects that come with regular use. Blog Chillizet introduced the skincare methods of Korean women in detail. The article first mentioned that millions of women from all over the world are using Korean skincare products. It said that although the 10-step skincare regimen does take a bit of time, if it is followed regularly as instructed, noticeable results will show. It explained that Korean women use 12 different skin care products to keep their skin smooth, transparent, and glowing, including BB cream, sunscreen, cleansing foam, sheet masks, lip balm, toner, nose cleansing strips, and serum. The blog Halo Ursynow reported that Korean cosmetics, with their transparent design, pretty packaging, natural ingredients, and new technologies, have been hitting the European market hard for several years. The ambition of Korean women to keep the youth and freshness of skin as long as possible, it said, led to the development of the cosmetics industry. The Korean sheet masks, creams, and serums that all help keep skin clean, moisturized, fresh, and smooth are often made with natural ingredients like aloe, raspberry, caviar, fruit acid, seaweed extract, and snail mucus, the blog said. Products made of natural ingredients are friendly and appealing factors to Polish women. 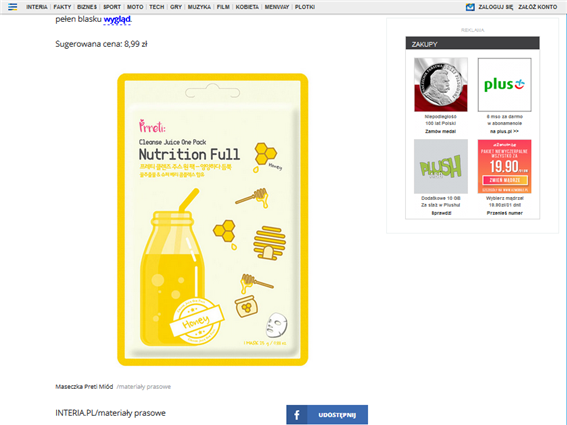 Portal Interia focused on masks formulated with honey, among the all the sheet masks available in Korea. It shared with readers how honey guarantees complete moisturization, accelerates the skin regeneration, and creates soft, smooth, and luminous skin. It introduced sheet masks from Korean brands Purederm, Prreti, BeauuGreen, and Coscodi with photos. According to the economic daily Gazeta Finansowa, the cosmetic chain store Hebe noticed the special effects and popularity of Korean cosmetic early and set up a separate section for Korean cosmetics in their stores. Hebe is a large-scale cosmetics chain store in Poland that recently opened its 170th store. In Hebe’s latest catalog, titled “Kierunek Korea,” it introduces Korean cosmetics that can be purchased from Hebe and advertised a sale from August 23 to September 30. For some products, Hebe is the only store where they can be purchased in Poland. Currently, the Korean cosmetic brands that are sold in Hebe are Benton, Skin79, Sesamis, Holika Holika, Purederm, I Want, Lomi Lomi, and Beauty Kei. The popularity and effectiveness of Korean cosmetics are standing out in Poland and throughout all of Europe. Blog Marketing Przy Kawie introduced the content of a European online discussion report published by the company SentiOne. According to the analysis of the online discussions on cosmetics for the face in England, Germany, Poland, Finland, Czechoslovakia, and Hungary in the first half of 2018, the age group of the major customers of European cosmetics is becoming lower. It turned out that 54 percent talked about sheet mask, 13.51 percent talked about ingredients, 9.04 percent talked about DIY products, 6.09 percent talked about Korean cosmetics, and 5.44 percent talked about cosmetics made of natural ingredients. This proves the popularity of various mask packs and natural ingredients in Europe. As can be seen by what is reported in Polish media, it is the eco-friendly natural ingredients and technology and the actual effects, not only the pretty appearance and packaging, that are the major factors that made Korean cosmetics popular in Europe and Poland. At least in cosmetics and skin care, Korea is the leader by far, and the future of the Korean cosmetics industry is bright.